Canadian real estate is still highly vulnerable, according to the latest assessment from Canada’s largest Crown Corporation. The Canada Housing and Mortgage Corporation (CMHC), the government backed org in charge of overseeing mortgage liquidity, released a new market assessment today. The release shows that Canadian real estate is still vulnerable into 2018 Q2. This vulnerability is largely due to overvaluation, with a special callout to Toronto and Vancouver. 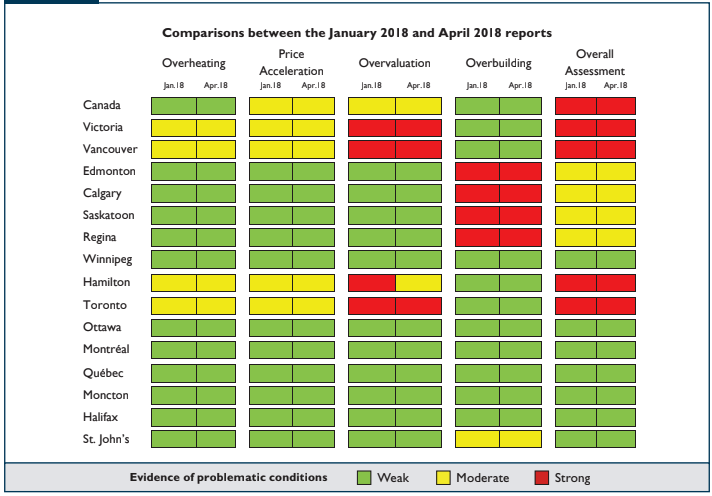 The CMHC evaluates Canada’s major urban centres under four major indicators: Overheating, price acceleration, overvaluation, and overbuildling. Price Acceleration: This is what it sounds like, a rapid acceleration in home prices. It’s evaluated on a three year rolling basis, so a few hot quarters won’t print acceleration. Just like a few cold quarters, won’t print deceleration. You need markets to demonstrate persistent acceleration to raise this indicator. Overvaluation: This indicator is based on market fundamentals. You know, things people ignore – like income, population, and interest rates. The further detached housing gets from the fundamentals of the people that live in a city, the further the overvaluation. What a novel concept. Overbuilding: This indicator is based on the absorption of new units, and rental vacancies. Unfortunately, it doesn’t tell us what level of demand for new units is speculative, because there’s really no way to measure that. The CMHC believes that Canadian real estate is highly vulnerable in April, with moderate evidence of overvaluation across the country. 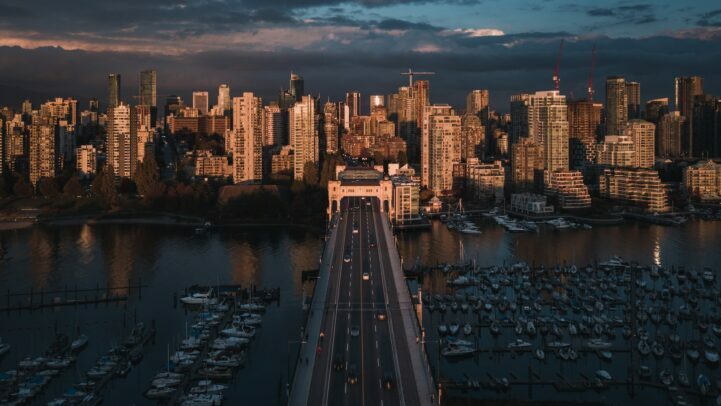 Analysts noted prices are high compared to “fundamental factors such as income and population.” They specifically called out Vancouver, Victoria, Toronto, and Hamilton as the markets having a broad impact on national numbers. Toronto real estate is cooling, but still remains highly vulnerable due to imbalances. The organization detected moderate price acceleration at the end of last year. The sales-to-new listings ratio is at 45%, well below the overheating mark of 70%. Overall, it sounds like things are heading in a healthier direction. Oh yeah, except for that whole overvaluation thing. The organization notes higher rates and new OSFI rules shifted demand to more affordable options. Basically, a lot of buyers are bidding up the same, smaller segment of housing. Consequently, the gap between prices and fundamentals remained well above the problematic threshold. Vancouver real estate remains highly vulnerable, with mortgage rules hitting the market. The organization noted that new mortgage rules concentrated buyers into more “affordable” segments of housing. This may be creating affordability challenges for “households with average local incomes.” Yes, the CMHC did just call out Vancouver’s foreign buyers. It was also the sauciest the CMHC gets. Soak it up. In case you haven’t guessed, they believe the market is still highly vulnerable to overvaluation. The increased competition for homes in the sub-$1 million dollar range has sent the floor of prices much higher. Further noting prices are well beyond the price fundamentals factors warrant. This has caused their overvaluation models to spike for the city. Oh yeah, there’s other markets too. Here’s a cheat sheet. 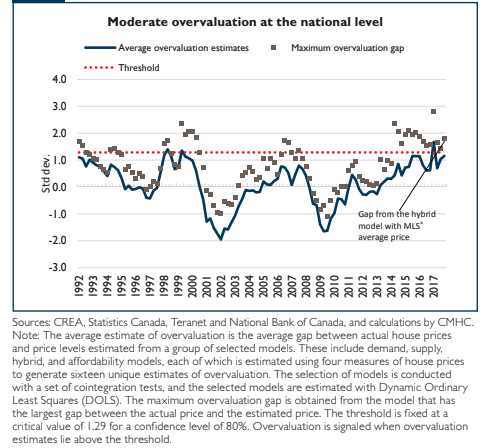 A government-backed agency, in charge of helping you get mortgages, thinks Canadian real estate is overvalued? 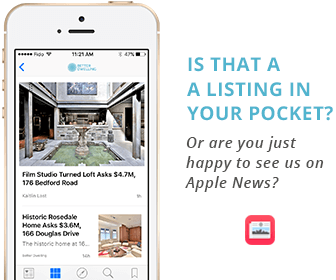 I mean, psh… they probably don’t know as much as your real estate agent. Like this post? Like us on Facebook for the next post in your feed. They needed years of study to determine this? Even with above average incomes, it’s not affordable. Businesses looking for high talented individuals willing to pay them, will have a hard time finding those professionals not willing to commute an hour+ each way to get to the office downtown in Vancouver. With gas prices bumping to $1.60/L it’s going to be even harder for those having to commute. My GF’s mom also said housing is hot, even though her investment property has been sitting on the market for 2 weeks without a peep. My uncles, neighbour who shovels poop for a living said you cant go wrong buying real estate as an investment. We are ALL poorer than we think. Unless your overweight energy. True. I see declining prices in Vancouver first at 35% for a few years, then 5-7% over the next 10-15 years until standard lots in Kitsilano are around the $300 mark or what they were in 1895. In other words, what they should be! And we only have a modest number of homes to sell them, relatively speaking. Not all Chinese are rich and can afford to buy. And the banks here won’t lend them money based on foreign income anymore. The usual disclaimer applies to trusting what you read from random strangers. Condos and lower end detached in the core are not going down in price in Toronto. That’s where all the millenials and retiring boomers want to live. It’s the houses outside the city and larger (more expensive) that are falling in price because they were not where people really wanted to live in the first place. Until all the millenials stop buying prices will not go down. Look at the home price index in the downtown core and you’ll see that prices are still going up. Boomers want to retire to a box in the sky. Millennials want to raise their families in a box in the sky. Suburbs have been growing exponentially for 80 years because nobody wants to live in them. This blog is useless. Only those who have staked their future on Toronto’s housing market can be trusted for an unbiased opinion. Any more erroneous beliefs you want to pass off as facts? Isn’t that exactly what Toronto Home Owner is trying to say? That this blog and its commenters know nothing, but he/she – as a Toronto home owner – knows where it’s at? That’s called an emotional premium. If the land that detached houses are on isn’t improving, but condo prices are, you have a marginal buyer issue. The marginal buyer, when buying the cheapest segment of an asset, with massive leverage, typically collapses when you can’t find the next marginal buyer. I know every homeowner and real estate agent thinks it’s different when it’s something they deal with, but objectively almost any finacialized product functions under marginal buyer theory, and they fail in the same way. It’s not that incomes are too low. It’s that prices are just too high. And our governments (federal, provincial, municipal) and central bank have been instrumental in manipulating and engineering this disaster. The central bank held interest rates too low for too long, and all levels of government have instituted policies to keep this Ponzi going. Phone, email, write a letter to the Federal government. Give them an earful. Tell them to decrease immigration numbers back down to 80,000 (like they used to be) and not 350,000 (as they are now). Tell them to stay the hell out of the market!!!!! All they do is make things worse. CMHC thinks Toronto and Vancouver are over valued and expensive? I don’t see house prices going down. The shittiest and ugliest houses are still selling on the market for exorbitant prices. All government intervention and the stupid new rules have done is to punish first time home buyers. The market is still unaffordable and nothing seems to be changing. As a first time home buyer I just can not seem to catch a break and find something affordable. Someone please wake me up from this nightmare already.